Hack Your Cake- The Best Icing Trick Ever! 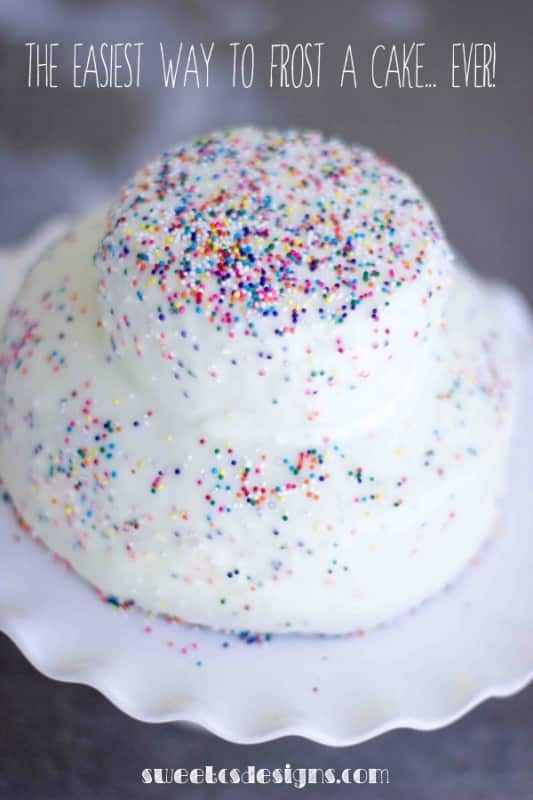 Home » Hack Your Cake- The Best Icing Trick Ever! This trick to hack your hack- the best icing trick ever– is one post you’ll need to save for later and share with all your friends! You can get a sleek, professional looking cake in just minutes with a can of store bought icing! I’ve had so many new followers lately, I have been meaning to reshare one of my absolute favorite posts of all time- and one of my top viewed posts! This is one of the best tips you will find online- it saves so much time when decorating cakes, cupcakes, cookies, and petit fours! Ever want a delicious, beautiful cake but don’t have a ton of time to make it? Take a bunch of Cake Decorating Classes, but don’t love the amount of effort you have to put in to make a beautiful cake? Or read about pourable fondant or how to smooth icing to look like fondant- but you just don’t have the time to pull it off before a big event? It’s time to learn How to frost a professional looking cake with pourable faux fondant in minutes! I have the most awesome trick in the world for you- you can get a smooth cake that looks like poured fondant in minutes. And the best part? 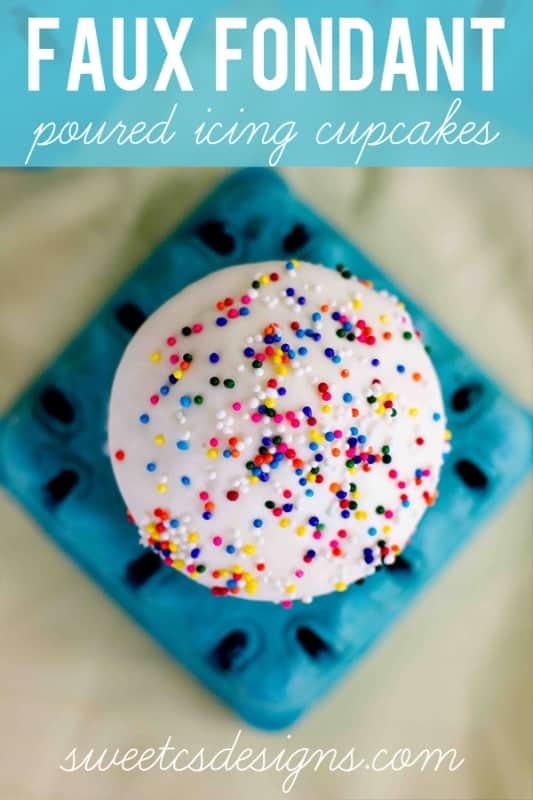 You will be using store bought icing, so you can do it in any flavor in just minutes! This is the perfect way to get a professional looking finish for birthday cakes, baby shower cakes, cake pops, brownie pops, shaped cakes, petit fours and even wedding cakes! First off, set your cool cake on a cookie rack over a flexible cutting board. This will help catch leftover icing that you can scoop up and re-use if needed. Next, microwave your frosting for two 15 second bursts- it should be completely melted but not hot. Let it sit for a minute or two to cool a bit (you want it still liquid- just no warmth). Then, in a circular motion, pour over your cake. Once you have used about 1/4 the can of icing and it looks pretty covered, let it sit and firm up for about 10 minutes. Microwave the icing again, for 15 seconds. Repeat the icing step to get a thicker, more even layer. Repeat once more if needed after cool. Once cake has set, slide it off cooling rack and onto clean cake plate. Decorate with sprinkles, fondant shapes, etc. Enjoy!! A couple of tips and tricks if you run into problems: -if your cake looks lumpy, take a knife or offset spatula and gently smooth the icing. Then add a thin layer of icing that is slightly warm over the cake -if your icing runs like crazy, it is too warm. let it set up for a minute. -if all else fails, sprinkle that bad boy up. 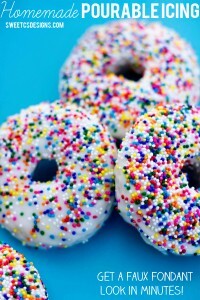 Sprinkles are instant beauty for cakes and kids love sprinkles! Wait a couple of minutes before adding sprinkles or decorations. In the photo below, you can see a few of my sprinkles sunk into the frosting because I was a bit excited and added them too early. No biggie… it’s still super cute but if you are a perfectionist, wait a few minutes. -You’ll want to pop this in the fridge OR wait a few hours for the icing to set before displaying or it will look quite shiny. Update: I used Cherrybrook Kitchen’s gluten free Chocolate Cake Mix and Pillsbury Creamy Supreme frosting for the people who asked. Again, if you run into lumps or areas you don’t love, you can go back over it just like you would a regular buttercream icing with an offset spatula. This just makes the icing spreadable, like a petit four. For a perfect result you will have to be sure your cake is level and not super lumpy just like any other cake you decorate. Love this idea? 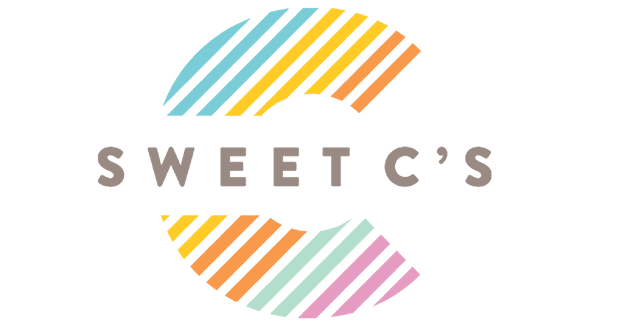 Sign up for daily emails from Sweet C’s Designs! And be sure to follow me on pinterest where I am always finding something fun! I abhor normal cake frosting. It’s just too thick for my taste. I have been doing this “trick” with my frosting for over 40 years now. The invention of the microwave sure has made this easier then the old days when I had to float the can of frosting in hot water. As a tip for some, whipped frostings (store bought) can be used as well. They will look funny when microwaved but just beat them, with a butter knife or spoon, for a few seconds and then pour onto your baked goods. I feel like I did this wrong. Was working with Bundt Cake, which is probably a harder cake to work with anyway. First coat was really uneven. I let it set a bit, and then smoothed with a wet offset frosting spatula. Going to open a second can of frosting and try to smooth it up a bit. BUT……. it still looks 1000 better than any Bundt Cake I have ever tried to frost conventionally. Once dry, can I do rosettes on the side? I can’t wait to try this! I wonder if this would work with homemade frosting…. I live abroad and don’t have access to store-bought and don’t have time to make fondant! 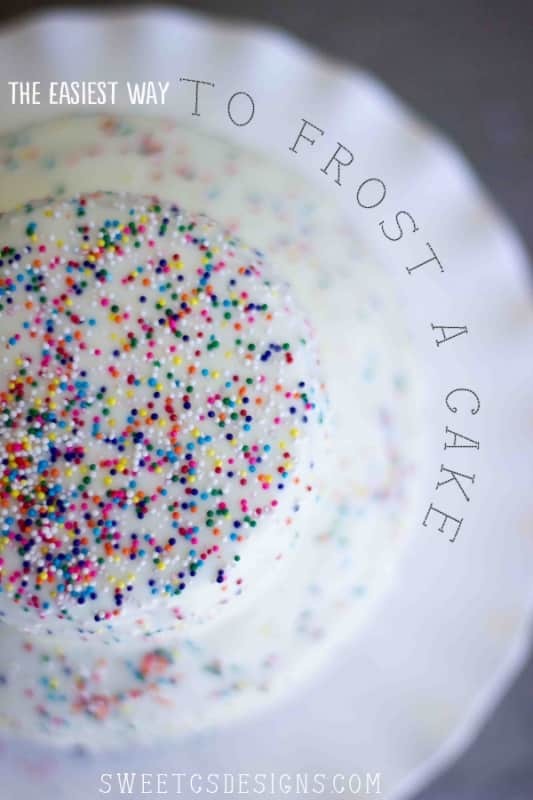 I do have a pourable frosting recipe – its not the same, and you definitely have to make more layers, but it’s similar to anything you’d pour on a petit four. You can also make a ganache with white chocolate. Great tip. This is going to save me so much time and hassle. Take a strip of fabric like a piece of a dish towel about 1 1/2 inch wide and long enough to go around the cake pan. Soak it in cold water. Wrap it around the cake pan and safety pin the ends together. Put in your cake batter and bake as usual. It helps the heat distribute more evenly so you don’t get a high spot in the middle. That is AWESOME! I am totally going to try it soon! Definitely pinned. I will totally be trying this out for my daughter’s birthday cake in a month. Thanks for sharing! This is so awesome. I can’t wait to try this trick out. Thanks for sharing. Thanks for linking up at #HomeMattersParty this week. I hope you will link up again next week. Looks so pretty! Found you at Foodie Friday Link Party. Thanks for sharing. Pinning! Hi Courtney! I just wanted to let you know that I chose your post as one of my top 5 for the week at #ShareTheWealthSunday! I’ll feature it on my page (FunMoneyMom) for this week’s party as well as on my FB page! Why have I never thought of this? Thanks for sharing on Share the Wealth Sunday. What a cool idea.. I am pinning for later! Love this!! Pinned this to our Mommy Monday Blog Hop board. Thanks for sharing! Love the trick! Now I wish we have some store-bought icing to make my life easier. PINNED and trying on a cake I need to make this week! My mouth is watering! 🙂 I would love for you to share this over at my new link party Making Memories Mondays going on now!